Country fans! 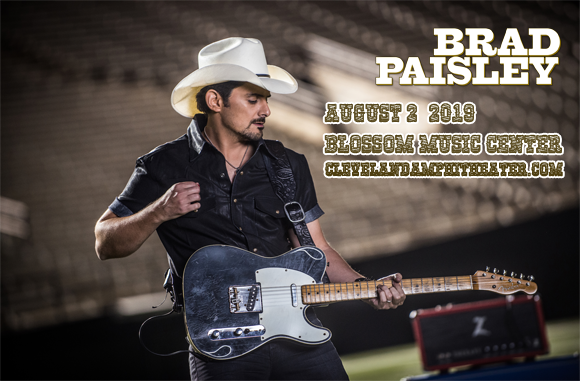 The endlessly talented Brad Paisley is getting out on the road again this summer, and he'll be owning the stage at Blossom Music Center on Friday 2nd August 2019! A world-class songwriter and second-to-none performer, Paisley is one of country's most exciting live acts, and this year fans can expect brand new material from the "Bucked Off" singer! Joining Paisley as his special guest support acts will be Chris Lane and Riley Green! Having spent his eight of his teenage years singing as a weekly guest on the USA's second oldest country music radio broadcast Jamboree USA, its no surprise that American country music singer, songwriter and guitarist Brad Paisley signed his first record deal just one week after graduating from Belmont University in Nashville, Tennessee in 1995. The contract was a songwriting deal with EMI Publishing, under which he wrote David Kersh's "Top 5" hit, "Another You", and co-wrote David Ball's 1999 single, "Watching My Baby Not Come Back". 1999 also saw Paisley sign with Arista Nashville as a solo artist, and he released his debut album, Who Needs Pictures, later that year. The album was certified platinum and launched four top twenty singles, two of which went to number-one. In 2001, Paisley was inducted into the Grand Ole Oprey – the youngest ever member at that time. Throughout his career, Paisley has charted thirty two top ten singles on the Billboard Hot Country Songs chart, including eighteen number ones, and has the record for the most consecutive number-one singles on the chart (ten). To date, Paisley has sold over 12 million albums and has recorded ten studio albums to date, as well as a Christmas album, with each receiving gold status or above from the RIAA. A highly-awarded artist, he has won three Grammy Awards, fourteen Academy of Country Music Awards, fourteen Country Music Association Awards, and two American Music Awards. His most recent album is 2017's Love and War.